We’d love your help. Let us know what’s wrong with this preview of Sparks Fly by Llinos Cathryn Thomas. After twenty-five years of single-minded determination, Marianne Gordon has finally achieved her ambition and been promoted to Principal of the Vesper School for Zero-Gravity Artistic Display. But her moment of triumph is cut short when she discovers that she must share her position with Josephine Knight, a celebrated zero-gravity performer who doesn’t know the first thing After twenty-five years of single-minded determination, Marianne Gordon has finally achieved her ambition and been promoted to Principal of the Vesper School for Zero-Gravity Artistic Display. But her moment of triumph is cut short when she discovers that she must share her position with Josephine Knight, a celebrated zero-gravity performer who doesn’t know the first thing about teaching. Deeply insulted, Marianne does her best to carry on as though Jo isn’t there, but Jo has a way of making her presence felt. When the future of Marianne’s beloved school is threatened, Jo may be the only person who can help – but only if Marianne can learn to let her in. To ask other readers questions about Sparks Fly, please sign up. This was a DELIGHT from start to finish, I loved both main characters and the chemistry between them, and the type of performance art invented! (I wish Z-GAD was a real thing.) If lesbians in space is your jam (and why wouldn't it be) cannot recommend this highly enough! This story is, for me, pure joy. Two very different, but capable and competent, women meet in a school, in space. There's some rivalry, and some falling in love, and a very satisfying denouement, all set in a thoroughly believable and charming universe that I want to hear more about. It's quiet and charming rather than full of explosions, but I have no problem with that whatsoever! I thought that there was exactly the right amount of Happenings for its novella length. I often find novellas a bit This story is, for me, pure joy. Two very different, but capable and competent, women meet in a school, in space. There's some rivalry, and some falling in love, and a very satisfying denouement, all set in a thoroughly believable and charming universe that I want to hear more about. It's quiet and charming rather than full of explosions, but I have no problem with that whatsoever! I thought that there was exactly the right amount of Happenings for its novella length. I often find novellas a bit frustrating: either there's too much filler or there's so much Stuff Happening that I don't understand why it wasn't a novel. Neither is the case here. I'd have read NOVELS more of it, but I didn't feel like it was too rushed or too padded out. This is just about perfect. I was also especially impressed by the description of the sport-slash-art that the school specialises in. It was a cute idea that could easily become cutesy, and it didn't. Instead it reminded me of the very best art about ballet. It had the sort of pull, and respect for both the artistry and the hard work, that I associate with the very best art about human achievement. I'd put this up there with Whip It and Ballet Shoes and Yuri On Ice as far as that goes. It's DIFFICULT to write about that well, and this has some set-piece descriptions that are just wonderful. This is such a delightful candy floss novella -- sweetly, engagingly written, with everything falling perfectly on its thoroughly satisfying beats. Set against an imaginative background of vividly described futuristic performing arts, this is one of those perfect short romances that sells you completely on how good the characters would be together and how much they deserve their happy ever after. It doesn't hurt that it is QUEER WOMEN BEING PROFESSIONALLY COMPETENT IN SPACE, which is pretty much my kryptonite, nor that the peril is of the mildest possible kind. Such a lovely, absorbing, satisfying romance! I really enjoyed watching the protagonists fall for each other. And the zero gravity art form was inspired - there's a sequence towards the end that's just magical. Highly recommended! 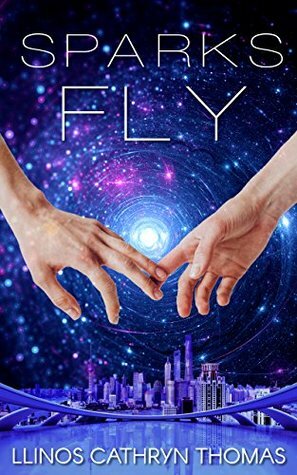 This novella is an absolutely adorable romance set at an intergalactic performing arts school, like a grownup version of the school from Ballet Shoes but in space, with two co-principals who've been pitted against each other...but OF COURSE they fall in love. It is really, really sweet and so much fun. I can't wait to read more stories from Llinos Cathryn Thomas! I love everything about these setups. It takes a real life setting I’ve occupied in one capacity or another for literally half my life and transposes it into the glittery, sparkling world of the science fiction fantastic. Gone are 83rd St or Newell Drive; now there are stars and comets and space-dust just beyond the story’s stage. I also adore that arts-college premises are inherently intimate; my personal preference is for fantasy and science fiction on a small, character and relationship driven scale rather than epic sagas deciding the fates of nations and planets. In other words, if you are like me this way, Sparks Fly is your next cute lesbian sci-fi read. The first of the two protagonists we meet is next in line to become headmistress at the dance school, after working there for years upon years and devoting her life. Imagine her shock when she finds out she’ll be sharing the post with a celebrity dancer while she recuperates from an injury sustained during a performance accident. I wouldn’t call it enemies-to-lovers; more like awkward-to-lovers, with some friendship and chemistry in the middle. Things don’t start out great for these two, but they’re both appealing, sympathetic characters and eventually they have to team up not only to achieve their artistic goals but to battle external conflicts. A little about the worldbuilding – the “dance” in the story actually involves people zooming around a three-dimensional stage area in anti-gravity pods, so it’s definitely got one foot firmly planted in science fiction, not just set on a space station. Other details are very easy to picture, so this is probably not a story whose imagining will strain your brain as you read to relax. Well, that was an absolute delight. This is a short but lovely romance story set against a backdrop of teaching and performing in a school dedicated to teaching a fictional performing art, Z-GAD on a space station. Z-GAD itself feels like a cross between ballet and an art performance put on by Cai Guo-Qiang, and feels like a natural artistic development for a society that's comfortably integrated space travel as something normal, while being different enough to be fun and original. I've never st Well, that was an absolute delight. This is a short but lovely romance story set against a backdrop of teaching and performing in a school dedicated to teaching a fictional performing art, Z-GAD on a space station. Z-GAD itself feels like a cross between ballet and an art performance put on by Cai Guo-Qiang, and feels like a natural artistic development for a society that's comfortably integrated space travel as something normal, while being different enough to be fun and original. I've never studied at an arts school or ballet theatre, but the story captured a mood and background that meshed nicely with what I'd imagined, and I can definitely empathise with all the struggles that go with putting on a series of performances while teaching. The two protagonists in this novella are very much my sort of character - both of them are experienced professionals in their respective fields, and - much to my great satisfaction - have been doing what they love or wanted to do (or both) for thirty years. I possibly sound grumpy and old as I say that, but it's great to have a nice romance story that doesn't involve teens or people in their twenties, but rather people who've lived enough to be sure of who they are and what they want to do with their lives. I particularly appreciated the fact that this is a romance story where neither of them had to give up what they love doing by the end of the novel. Although the initial rivarly between the characters was relatively quickly resolved, it felt genuine and sympathetic in its origins; it also made seeing the two protagonists working together as they resolved things that much more entertaining. I can honestly say I greatly enjoyed watching an established and corrosive system of patronage getting the boot, too. All in all, this was a lovely read. This is a good, quick, read. I burned through this in two commutes, and that’s time I normally spend playing games. The author’s done a really solid job with the characters development through the story. I was particularly impressed with how she would bounce from one characters point of view to another, sometimes mid chapter, and yet it was never jarring or confusing. As both of our protagonists have distinct styles and flavours to them. I’d love to read more in this world, there’s a lot going on This is a good, quick, read. I burned through this in two commutes, and that’s time I normally spend playing games. I’d love to read more in this world, there’s a lot going on in the background that I’d really want to explore. Talk of Lunar colonies, a galaxy spanning civilisation, there’s literally space to expand! Also Z-GAD, just like some of our dances or artistic forms have evolved from martial training, small two man pods with a pilot and pyrotechnician feels like they must have evolved from fighter pilot training. What happened in their past, and how long ago must it have been for a martial skill to become an art form, and what risk of it returning? Full disclosure, the author is a friend, but that just means I found out about this book's existence - I'd have loved it no matter what. It's sweet and lovely, with exactly enough dilemma for a romance novella and gorgeous world-building. I'm sad Z-GAD doesn't exist (yet). The romance was lovely, I adored Marianne and Jo, and this was exactly the pick me up I needed after a bad day. This is such a fun, sweet story, with cool spacedancing and lovable characters and a neat satisfying romantic arc. What more do you want from this life, I ask you. Sparks Fly by Llinos Cathryn Thomas is a cute space romance novella between two older women with a happy ending. While I did like the characters and the plot, I wish Jo’s character was more developed and the setting was better written and more established. After twenty-five years of dedication and determination, Marianne Gordon has finally achieved her dream of becoming principal of the prestigious Vesper Station School for Zero-Gravity Artistic Display. However, her big moment is ruined when she Sparks Fly by Llinos Cathryn Thomas is a cute space romance novella between two older women with a happy ending. While I did like the characters and the plot, I wish Jo’s character was more developed and the setting was better written and more established. After twenty-five years of dedication and determination, Marianne Gordon has finally achieved her dream of becoming principal of the prestigious Vesper Station School for Zero-Gravity Artistic Display. However, her big moment is ruined when she is forced to co-principal with Josephine Knight, a famous zero-gravity performer who is recovering from a terrible accident and who doesn’t know anything about teaching. Both women must learn to work together and sparks soon begin to fly between them. They must also stand together when the future of Marianne’s beloved school is in jeopardy. I like that the book shares perspective between Marianne and Jo. They both have very distinct voices and personalities. However, there’s always a drawback to featuring two viewpoints because one character always suffers. While I do like Jo, I really wish I knew more about her, especially her past. The romance between Marianne and Jo is sweet and fairly well-developed given the book’s length. I really like that they learn to appreciate and understand each other before the romance takes off. I’m also very happy that both characters are older women who act their age and handle their conflicts maturely and organically. I went into this book expecting to really love the space setting but I was disappointed by it. The setting is not as well established as it could be. I did not feel fully immersed in this futuristic space world at all. Furthermore, I also want a better explanation of the performing art that is such an integral part of the story. I struggled to figure out what exactly it was and what was happening and my confusion really took me out of the story. Sparks Fly is a fluffy and good read. I like the characters and the romance is sweet. Although I wish Jo had been better developed and I wanted the setting to be much more fleshed out, I did like this novella. If you like happy endings and are looking for a super quick read, check out Sparks Fly! This is a short, absolutely lovely f/f romance set on a space station. I loved that the protagonists were a bit older, with maturity and life experience, and they have a compelling dynamic. If I wish anything more from this book, it’s that it were twice as long so it had time to flesh out its world in greater detail. But it’s a delightful, heartwarming read as it is. Delightful novella with middle aged women falling in love! Do you know how dare it is to find a great f/f sci-fi story where the characters aren't teenagers or young adults? This was absolutely delightful, Jo and Marianne were well fleshed out, the plot was engaging. Definitely recommend it and will keep an eye out for more of Thomas' books! I have Shira Glassman to thank for having called this marvelous short work to my attention. She said that it reminded her of my own work, and that piqued my interest. And, indeed, I do see the similarities. It's quite a quick read, and a satisfying one. Dancer and choreographer meet angry, then concile and eventually love. The joy of the dance suffuses the work -- which is all the more interesting, as it isn't dancing as we think of it, but more like precision flying, the sort of thing the Blue A I have Shira Glassman to thank for having called this marvelous short work to my attention. She said that it reminded her of my own work, and that piqued my interest. And, indeed, I do see the similarities. It's quite a quick read, and a satisfying one. Dancer and choreographer meet angry, then concile and eventually love. The joy of the dance suffuses the work -- which is all the more interesting, as it isn't dancing as we think of it, but more like precision flying, the sort of thing the Blue Angels and Thunderbirds do. For a science fiction romance, Sparks Fly is actually pretty light on the science fiction, and I really struggled to get a sense of the setting in spite of the book taking place at a futuristic performing arts school. Sparks Fly has some decent components, but they don’t fit together in a terribly compelling way. After finishing the novella, I was left with the sense that I barely knew the characters. In the end, the often ambiguous setting and the lack of emotional connection between the heroin For a science fiction romance, Sparks Fly is actually pretty light on the science fiction, and I really struggled to get a sense of the setting in spite of the book taking place at a futuristic performing arts school. Sparks Fly has some decent components, but they don’t fit together in a terribly compelling way. After finishing the novella, I was left with the sense that I barely knew the characters. In the end, the often ambiguous setting and the lack of emotional connection between the heroines made this a difficult book with which to connect. This is an endearing romance between two very different women. At only 70 pages, it doesn't leave much room for character development or further detail on their lives and personalities, which can affect the readers' immersion in the story, but it doesn't stop you from enjoying the book. Overall it's a good read, and I finished curious to know more of the world the main characters inhabited, so that's a plus. I really enjoyed the idea behind this, and I also really enjoyed the writing. However the relationship felt very flat, everything was incredibly fast, and just didn't click for me. There were really only two characters in the whole thing, which was disappointing, no supporting cast at all. I think another 100 pages a few more characters and this would have been great. This was a really enjoyable sci fi romance that I finished in a single sitting. Both the leads were compelling and I cared about them, though I feel the author could have given more depth to both them and the events surrounding them. Overall the romance was satisfying and I will be looking for more stories from the author. Firstly, hoorah for f/f romance in SPACE! This was an absolutely charming novella. I read it in one sitting and honestly would have happily done the same if it was twice as long. I loved the characters and their journeys (particularly Jo learning what being a teacher is all about) and how much I ended up caring about the art of pyrotechnical space-pod ballet. This novella is a delight - well-drawn characters, good pacing, imaginative world-building, and an easy, evocative style that is a real pleasure to read. I thoroughly enjoyed it and highly recommend it to anyone looking for a sweet piece of f/f escapism. It’s cute, it’s sweet and I loved the two lead characters. A great book not long enough and the side f / f not developed enough for my taste. But the story is original, and reads in one go. I highly recommend it and an author to follow. We join Marianne at a time that should be a major win - being promoted to the head position at her art school. Instead of the sweetness of victory, though, Marianne is left with a bitter taste when Jo, injured but highly regarded zero-g pilot, is given the position alongside her. I enjoyed the character development and the story, although at times I found the descriptions of the art form entirely baffling. Marianne and Jo had things to learn from one another, which highlights their strengths as a couple and lends credibility to their character arcs. I loved Marianne's sass and wit, and loved her better at every show of steel. Jo, I took longer to warm up to - but she eventually shows a protective streak that won me over (into a puddle). The novella also gave us just a taste of a fun and unusual sci fi world - just one corner of it, like we only see one corner of the heroines' lives. As I said, I had a hard time picturing the artistry of little zero-grav flying units zooming around to music, shooting sparklers all over. Still, I love inventive and different looks at science fiction worlds - imagining an artistic culture that might arise specifically from a space station is great fun. Overall, this novella had good pacing and build-up, fun world building, and relatable characters. I thoroughly enjoyed it! I really wanted to like this, but I didn't get a clear sense of either woman's personality, so it didn't hold my interest. I also felt like Marianne was incredibly naive to think the board would let her do whatever she wanted now that she was "in charge" - after working there for so long in a senior role, shouldn't she have a better understanding of how power works within the organization? DNF disappointedly at 75%. Llinos Cathryn Thomas comes from North Wales and lives in London with her wife and their books. She likes dragons, spaceships and cake. She writes about pretty much those same things.